Intel has begun to deliver their 5th Gen Broadwell NUCs. At the moment, only NUCs with i3 CPUs are available. NUCs with faster CPUs are available in the next few weeks. I could get my hands on the NUC5i3MYHE. That's the version with a 2.5" HDD slot and without integrated WLAN. 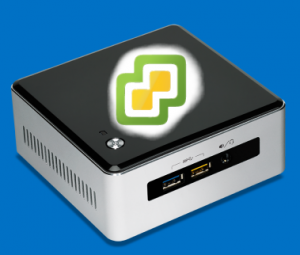 This post quickly explains how to get ESXi running on the 5th Gen NUC. As known from 3th and 4th gen NUCs, it is not possible to use the ESXi Installer provided by VMware. NUC has a Mini HDMI and Mini DisplayPort. Make sure to have an adapter. You have to create a customized ESXi Image. The custom driver has been created about a year ago by GLRoman and is available at VMware Community or at the vibsdepot from VMware Front Experience. You can either download ESXi and the e1000 driver manually, or simply use the following PowerCLI commands to create a customized ISO. This will download all required files automatically. If you are unfamiliar with PowerCLI, read this post for a more detailed guide. With this image you should be able to install ESXi 5.5 on a USB flash drive connected to the NUC. At this point, ESXi does not detect the storage controller, so you are not able to use local storage. 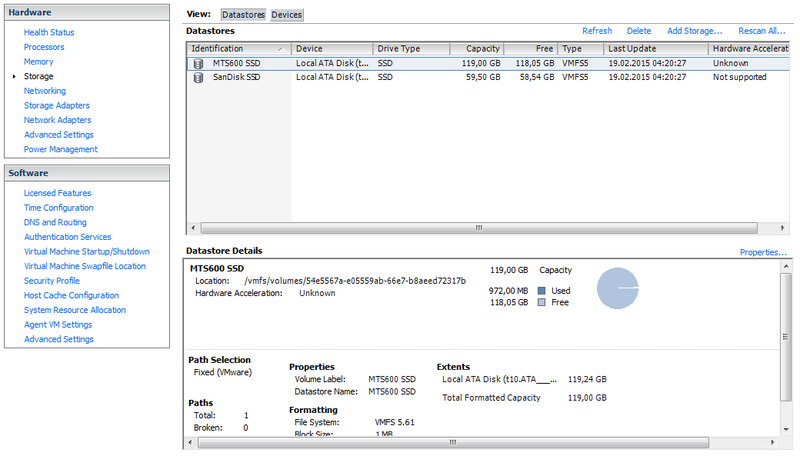 ESXi 5.5 does not detect local storage controllers because the PCI ID is not mapped to the AHCI driver. This workaround is no longer required as Andreas Peetz has added the PCI ID to his sata-xahci package. Additional Note: I've also tried to install ESXi 6.0 RC to the NUC. It was not required to create a custom ISO. The network card was detected during installation with the ISO provided by VMware. The AHCI workaround was still required. Please note that this was tested with beta software and might change when 6.0 is GA.
Hi. Super thanks for this information!!!! Thanks to this great info I have my NUC5i3RYH running with an SSH disk and booting from USB stick. The only problem I have is to force the NUC to boot from USB. While it is set as my priority boot, I get "a bootable device has not been detected". if I hit f10 and select the USB all is fine. Do you have this same issue? No. I haven't changed anything in the BIOS. ESXi boots from USB without problems (front and back usb port). Thanks for testing out the 5th Gen Intel NUC and for trying it out on the 6.0 Beta. Hopefully it will continue to work on the GA version. I am due for a Home Lab refresh and was planning on a similar setup to yours with 3 NUCs and VSAN. On the New 5th Gen NUC, if there still a slot where you can use a mini PCIe NIC under the msata SSD like vmnick did here: http://vmnick0.me/?p=7 or this: https://twitter.com/florian_casse/status/560888735525765122/photo/1 I would like to put in a 2nd NIC if possible, so I was just wondering. Thanks for sharing you setup! So, one top to anyone else trying to do this. Do not Disable EFI boot. While I am booting from "legacy USB", if I disable the EFI boot, I get the error no boot device found. Leaving this option turned on everything works great. Another nice setting in the Bios is to manage what to do in case of power failure. I have it set to auto power on when power is restored, as my nuc will go into a datacenter, so if someone accidently unplugs it and plugs it back in, it will just power on automatic again. In the meantime I have updated my sata-xahci package to include the PCI ID (8086:9c83) of the NUC controller, so the workaround with manually editing /bootbank/sata_ahc.v00 is no longer necessary. to your PowerCLI commands (right before the Export-command) to build the customized ISO with the sata-xahci package. Thank you for this.. worked great following the above instructions and then adding this line before compiling the iso! I have updated firmware to last version witouth solution. I believe it's because the manufacturer and model (shown in a screenshot above) are those ? characters, so this is causing the HTML response to be malformed. Anyone know how to modify the manufacturer and model which is being reported back to ESXi? reports the same error. Doesn't seem possible to add the host to vcenter. Download "Intel intergrator toolkit" and the bios for the system. To which values have you set the SMBIOS options? 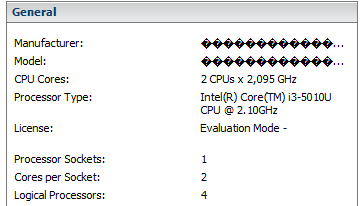 How many VM's can run on the same time on this i3 (broadwell) with 16GB mem. Will it perform enhough for a homelab ore is the i5 ore i7 the beter option. Can it handle the iops under normal conditions. Like to run a small Citrix enviroment with Xenserver for study objectives. Awesome article, thanks for the information. You can only pass it to a VM und use it as NIC there. That's a great article - worked like a charm thanks. A related issue I've found is that ESXi doesn't detect the serial ports - presumably it's a similar issue to the SATA - do you know how to fix? Quick question: are you able to share the wireless adapter with a guest operating system via pci passthrough? I'm on the fence about getting a newer NUC...if the wireless works to a guest, I think I'll give it a go. Well written post, really appreciate it. Just got myself a 5th Gen NUC vPro and hope to use it as the mgmt layer for NSX lab. Anyone have references for installing ESX 5.5 Update 2? Can you provide steps on how you did the AHCI workaround to detect the m.2 SSD during setup. I get to the installer screen, but under Local: it only shows the USB flashdrive I created with Rufus. I'm using the stock current version of ESXi v6 from VM's website. You no longer need the AHCI Workaround. Simply create a customized ISO with the sata-xahci package and use the created ISO to install ESXi. The process for ESXi 6.0 is explained here. I just installed ESX on a NUC5I3RYH and created a custom image and got the NIC working just fine. I'm not able to see or add the integrated wifi to ESX. Has anyone been able to get that working? Help me Jake, I have done about 10 custom images based on these instructions and several others on the internet. I have the same nuc as you but it continually fails on network adapter. I have used both power cli and esxi customizer with no luck. I am wondering if the new 2015 model has a different nic. Any help you can provide. I have injected drivers before on esxi installations and am pretty familiar witht he process. Just can't get this one to work. Which NUC model do you have? Copyrright (c) 2007-2014 VMware, Inc. There is a blinking cursor underneath but i am unable to type anything or get out of the screen. Don't have an old NUC to compare to. Any help appreciated. I will continue to look and post if I find. Entry 13 looks on point here. Follow his procedure using the ESXi-Customizer-PS script and add in the Sata driver with the -pkgDir option. Worked with v6 and v5.5 ESXi. Hello... I'm getting this error when doing the powercli from administrator mode.. Apparently when googled it suggests that it can't create the folder or the file. But the first 5/6 commands worked fine.... just the important one didn't... I've been working on trying to get esxi installed on my nuc for about 6 hours today... and this is just one of the MANY issues i've ran into trying to get different versions working. Please help me... below is the error. I did also try to create a folder with that name - I'm then given an error saying that it already exists and I can overwrite it with a -force ... when I do that it goes back to the standard error you see above. I figured out my issue i somehow was running it from that locked directory.. I went back and ran the powercli from the system32 directory where it installed from.. then changed the create iso directory to a c:users\mydocuments type of directory with "" around the entire directory path for spaces and whatnot and it created the iso... hopefully this works... i'm personally using gen5 i-7 16gig ram... and my day started out without it recognizing my m.2 500gig ssd, it also wouldn't recognize my samsung... then i went to doing the create iso by using vmware injector vib files and added several files (it would then recognize my hard drives, but got to the point were it wouldn't recognize my nic... which lead me eventually to this site. ) So after 7 hours of troubleshooting i'm ready for a mt. dew and some anime. I need a little extra special hand holding. I am not a vmware or server guy. The last Server OS I used was Novell 5.1. I am attempting to install VMware 6.0.0 on my NUC so I can load up OVF file for Cisco FireSIGHT Management Center. I managed to get ESXi installed on a USB drive and it automagically detected my NIC. However, I cannot get it to detect my local disk. I have followed the steps listed above SSH-ing into the host and running the commands listed. I then rebooted and still no local disk. That seemed easier than building a customized ISO. Can anyone show me the error of my ways in getting my local disk to work? Download the vib (http://vibsdepot.v-front.de/depot/vft/sata-xahci-1.32/sata-xahci-1.32-1.x86_64.vib) copy it to your ESXi and install it with "esxcli software vib install -v sata-xahci-1.32-1.x86_64.vib"
That happens when the cmdlets are not loaded. Did you open "PowerShell" or "PowerCLI"? PowerCLI is VMwares PowerShell extension and loads VMware cmdlets automatically. They are not available in "powershell" by default. You can see all components with "Get-PSSnapin". The snapin you are looking for is "VMware.ImageBuilder". Hi nuc5ppyhESXI, What error are you getting when you try connect with VI client? I dont have a nuc5ppyh to test with. Usually if you can ping it and the ports are open then you should be able to connect with username root and the password you created during install. You wont get passed “Relocating modules…” screen on the Host, but that doesn't matter because everything can be configured via VI client over the network. In regards to the SATA drive script, Andreas has recently added the NUC5CPYH SATA controller (Class 0106: 8086:22a3) to his sata-xahci package, so the above script should no longer be required for that. Thanks for the info. I did not create a root password, not sure where that is being done(ks.cfg?). Getting same error regardless of username/password combination. Also tried to use ks= boot option with default example ks.cfg, but stuck at "Relocating modules..."
vSphere Client could not connect to "192.168.1.111". Hi nuc5ppyhESXI. I used a workstation PC with VMware workstation installed and installed ESXi onto a USB flash drive by booting the customized ISO on a VMware Workstation VM. That process allows you to set the root password during the install wizard, which you'll need when you connect with VI client. Hi Matt, thanks for all the info, got it all working (NUC5PPYH ESXi 6.0.0). Awesome articles. "install to USB key by booting VMware Workstation with custom ISO"
"install with USB key created from custom ISO"
Interesting thing is, that after booting from the USB, ESXi installs itself to the SSD. Just installed ESXi 6.0U1a on two of my new Intel NUC BLKNUC5I5MYHE and these instructions for adding the internal SATA SSD storage was very helpful. Thank you!! Will this also work on the new Intel NUC "NUC6i5SYH"? I am still trying to run 5.5. The commands for the custom image appear to be missing some files since updates have come out. My NUC5 currently sees the NIC since I installed update 3 but it does not see the storage drivers.